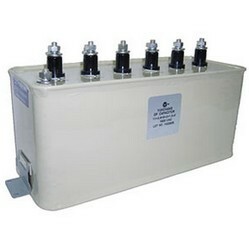 Capacitor was designed with multiple sections specifically to the demand of capacity regulating for UV curing equipments. Their performances can endurance the transient, switching, and varied currents. Use excellent film as dielectric, and impregnate biodegradable and no toxicity insulation oils. High quality, capacitance stable and low temperature rise are the best selection for UV curing equipments. 10.External discharging resisters: Residual voltage drops to lower than 50V within 5 minutes after capacitor is disconnected from power.